1. Social Media: It has evolved tremendously and given creative artists and crafters a chance to reach out and publicize their work globally. 2. Bazaars and Markets: A great way of showing your work to the public and speak to your customers directly. Our local bazaar and market events has certainly moved forward from the days of Pasar Malam (night narket); today, pop up markets and bazaars are not only a lifestyle concept, but it is a good opportunity for artists and crafters to set up booth and sell or network with their potential customers. Running a Creative Arts & Crafts Biz Now is Possible! Most successful artists and crafters started off as bazaar vendors. To this date, some of them still participate at bazaars and handmade markets because they get to experience different crowd and events held at different locations. The benefits of participating at handmade bazaars and markets is that it gives you the freedom to invest in your "store", plan your dates and decorate it as attractive as you want. Unlike investing in a retail store or a shop lot which costs a bomb, having a creative arts & crafts business allows you to start at a booth with a smaller capital and eventually grow as your business expands. One of the hottest bazaar organizers in Klang Valley, I Love Bazaar is renowned for organizing bazaars with consistency. With an aim to meet the rise of the handmade scene, I Love Bazaar introduces I Love Bazaar: Handmade Market, dedicated only to the creative community, gathering all creative talents in one place. More exposure for homegrown creative talents! 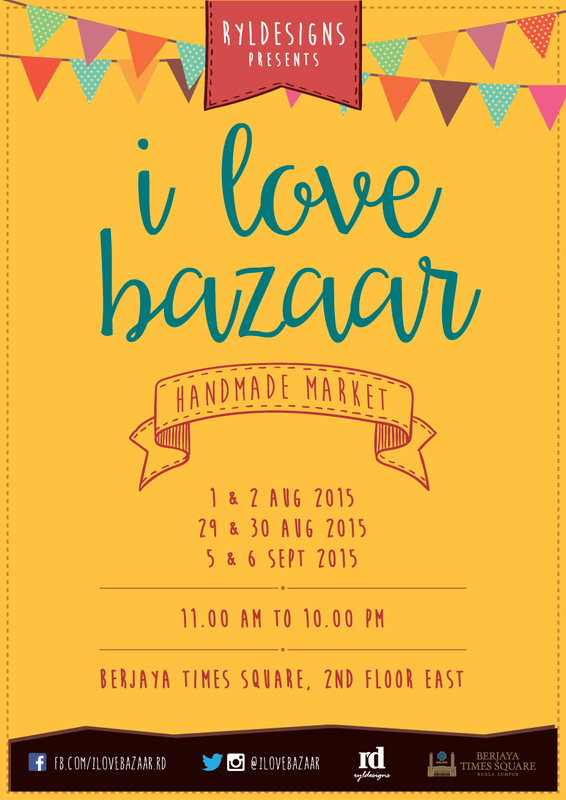 The I Love Bazaar: Handmade Market is strictly a handmade event only, welcoming handmade artisans and crafters to apply as vendor and showcase your masterpieces. Creative enthusiasts are also welcome to join the fun, mark your calendars and visit the event for your handmade shopping. - Inclusive of 2 units of 3 x 3 Ft Tables, 2 chairs and a table cloth. *Available booths and dates can be viewed via link. *This event is a handmade arts & crafts event only. *Applicable only for handmade artists and crafters.